Our best Halyard (rope) is solid braided multifilament polypropylene designed to be long lasting and problem free. When choosing a length of halyard make sure you double it for your pole size. For example when choosing halyard for a 30ft. flagpole use 60' of halyard. Black halyard does not come pre-bagged, we must cut this to order. Please call to order black at 1-800-777-1706. 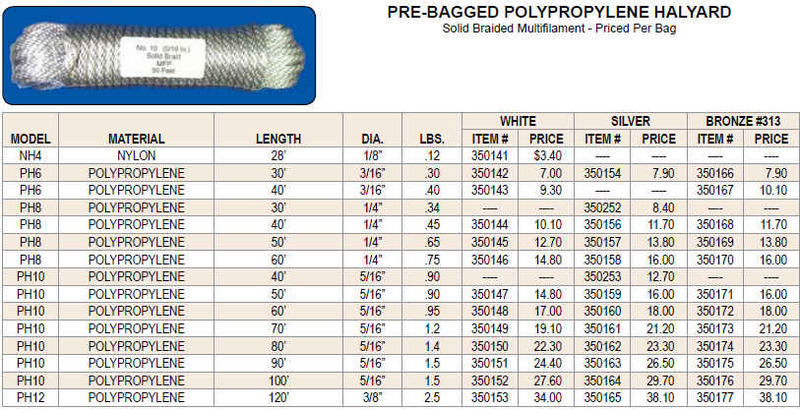 Please note that we do sell one nylon halyard for smaller poles as indicated in the table above.